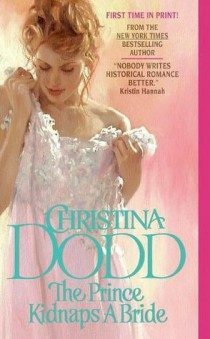 Christina Dodd brings you the final, great adventure in the Lost Princesses Series … and the grandest, most royal romance of all! Betrothed in the cradle, Princess Sorcha and Prince Rainger were destined to rule their countries together. Then revolution swept the land, sending Sorcha to a remote Scottish island convent—and Rainger into a dungeon so deep rumor claimed he was dead. Now danger threatens, and Sorcha must travel home with a simple fisherman as her companion…a fisherman who is Prince Rangier in disguise. Changed from a careless lad to a dangerous man, he’s determined to win back his kingdom—and the woman he wants more than life itself. But how can he protect Sorcha when she thinks every person she meets is her friend, every tavern is an opportunity to sing bawdy songs, and each turn in the road hides a new adventure? To keep his princess safe, he must resort to the most treacherous weapon a man can wield: seduction. Thank you for being so patient with me through six years of learning to write. But I’ll never forget you or what you taught me. Who are Bernadette and Roberto? They’re the hero and heroine of my very first, never-published and never-to-be-published novel, ETERNAL SPRING. But I had a great time writing it, and I wanted to acknowledge the two characters and our long relationship. So not only do I mention them in the dedication, but if you pay close attention while you read THE PRINCE KIDNAPS A BRIDE, you’ll catch a the brief glimpse into the opening scene of that first book where Roberto catches Bernadette bathing under a waterfall. Now — enjoy the first excerpt! From the time Crown Princess Sorcha was three, she prayed for a baby brother. A baby brother would be a prince and the heir to the throne of Beaumontagne, leaving Sorcha free to be like other children. Well, not like other children, but at least like her two sisters who were mere princesses. Unfortunately for Sorcha’s hopes and to the little family’s deep distress, when Sorcha was six, her queen-mother died bearing a third daughter. So Grandmamma came to live with them. Sorcha never forgot that day. The opulent traveling coach drew up to the great door of the castle, and Grandmamma stepped out — ancient, tall, skinny, with regal bearing, a thick, carved cane, white hair and cold blue eyes that froze Sorcha down to her bones. From that moment, Sorcha grew up under the direct glare of Grandmamma's critical gaze. Of course, Grandmamma also made sure that Princess Clarice and Princess Amy were supervised to within an inch of their lives — no one could accuse Grandmamma of shirking her duties — but it was Sorcha who occupied most of her time and attention. Grandmamma approved Sorcha's tutors and made sure that Sorcha was taught everything a crown princess should know — language, mathematics, logic, history, music, sketching, philosophy, and dance. She made sure that the elderly archbishop of the Church of Beaumontagne visited every Sunday, rain, snow or shine to teach the princesses their religion and when he left, Grandmamma personally drilled Sorcha on her catechism. She instructed her in geography, showing her maps and demanding she know rivers, mountains and seas. Somehow, Grandmamma managed to make tiny Beaumontagne perched on the spine of the Pyrenees between Spain and France sound like a center of culture and learning — in fact, the most important country in Europe. In a private weekly session, Grandmamma taught Sorcha the art of governing, posing intricate crises that would face a queen and demanding Sorcha unravel the problem. Grandmamma made Sorcha argue law, taking either side as Grandmamma required and with Grandmamma as her opponent. And Grandmamma never let an occasion pass without reminding Sorcha that the crown princess and the crown princess alone was responsible for the continuation of the Beaumontagnian royal line. From Sorcha, Grandmamma demanded perfection. Which was why, at the age of twenty-five, Sorcha found living in a convent on a tiny, rocky, barren island off the northern coast of Scotland a freedom she cherished. Her duties there were simple. She prayed. She read. She gardened. She wore a simple brown habit. To differentiate her from a novice, she wear no headdress, and because she was a princess of Beaumontagne, she wore the silver cross of her church on a chain around her neck. She kept the plants alive in the greenhouse in the winter and in the garden in the summer. She ate with the nuns and slept in her bare little room. And after so many years of listening to Grandmamma's voice nagging on and on, she cherished the silence. Yet one night almost three years ago, she had had a dream. A dream? No, it had been more than a dream. It had been a vision of unremitting darkness … and empty years. Sorcha woke with a start and a horrified gasp. The cross she wore around her neck seared her chest. She wrenched it from beneath her nightgown and in the darkness of her cell the silver gleamed like a blue coal. It blistered the palm of her hand, but she grasped it as tightly as she could, desperately needing its comfort. Sitting up in her bed, she trembled, gasping for air, wanting nothing so much as to breathe, escape, to live! And the first light of dawn shined in her cell, and the first seabird called its high, sweet call outside her window. She ran to the window, wrapped her hands around the cold bars, and looked out at the ocean, trying to clear the remnants of that awful dream from her mind. Yet she couldn’t, and in all the time since, never had she regained her serenity. Day after day she found herself donning her brown wool cloak and wandering over the island as if seeking something. Or as if something were seeking her. The air was foul. The indifferent stones closed in around her. No voice disturbed the silence. No hand reached out to bind her wounds or cure her pain. The bones of rats were her bed and the long drape of cobwebs her blanket. And she didn’t care. Somewhere close, water seeped into a pool, and the slow drip which had once driven her mad now contributed to her indifference. Her world was sorrow and loneliness. She was dying, and she welcomed the end of desolation, of grief, of anguish.